I hold my hands up and confess that we are not a camping family. 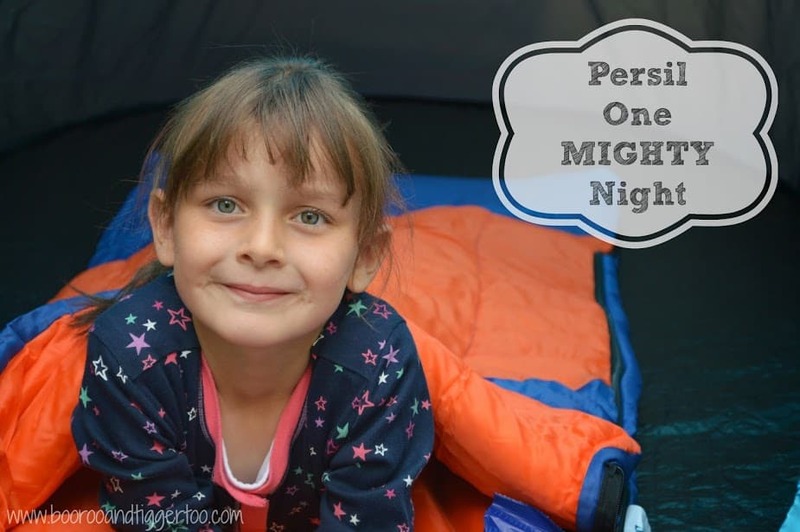 So when Netmums challenged us to take part in Persil’s One Mighty Night campaign I was a little anxious as to how we would fulfill the challenge. We received a pop up tent, sleeping bag, headlight, whistle (which I may have *accidentally* misplaced before Roo and Tigger go their hands on it, along with a bag of marshmallows and a bottle or Persil Small and Mighty. As soon as the tent arrived we decided to see what it was like and set it up in our back yard. This in itself was an issue… we only have a back yard (decked admittedly but still no soft grass under foot) and it is small too so the tent managed to take up a large chunk. The kids weren’t bothered by this and Roo quickly ran upstairs to get her onesie on. Roo’s school participate in Forest School each term so she is always happy to let me know about forest safety, the do’s and don’ts of camping and how we have to be respectful of nature. So I think by getting the tent out it gave the opportunity to pretend to be the Forest School leader and tell inform her teddies all about camping etc. 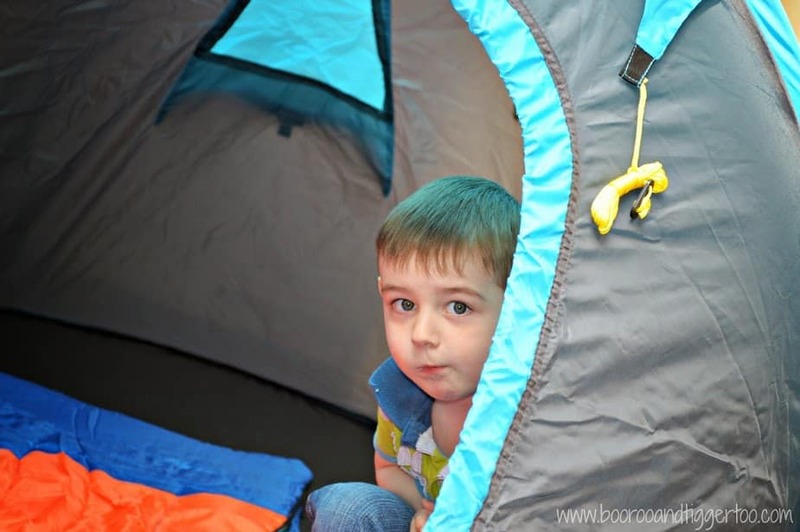 Tigger was a little more cautious of the tent and after his initial excitement of playing peek-a-boo he decided that the tent was not for him. I don’t think he liked the shadows from the washing swaying in the breeze. After an afternoon of playing in the tent, Roo decided that she would prefer to sleep in her own bed rather than the tent. Can’t say I blame her as the decking boards aren’t exactly comfortable even with a sleeping to keep you warm. It was only when she started to get undressed for the bath did I notice the state of her socks! she had managed to run around all afternoon in the yard with no shoes or slippers on so her once white socks were, well, black! Thankfully I had been sent a bottle of Persil Small and Mighty, their new bottles have a pop out stain eraser ball. Simply pop out, pour and rub tough stains before you do your usual wash and hey presto stains are gone. 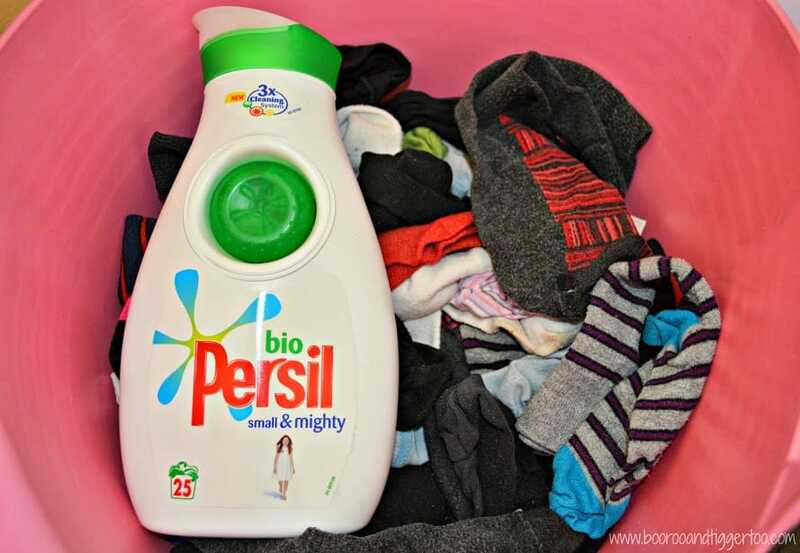 Thank you Persil, your Small and Mighty bottle has saved another pair of socks from ending up in the bin and saved my sanity. Disclosure Policy: I am a member of the Netmums Blogging Network, a unique community of parent bloggers from around the UK who have been handpicked by the Netmums team to review products and brands on their behalf. I have been paid expenses and supplied with a product sample for this review but retain all editorial control. All my Netmums Reviews will display the Netmums logo within the post.